No because running so hard turns days into weeks, and weeks into years and so on. I was only supposed to be local and I always gotta ask someone what day of the week and what date it is. Carl , s you need to go to miller/coors in irwindale. I never got a load of coors lt heading to Fresno that was less that 53 K. But usually closer to 54k. They don't care how you do it. If they can lay 4 twelve packs on the back, they do it. Maybe that one truck you say turns like an aircraft is a W 900L that's quite a longer hood to a straight W900. I can hop in any truck and drive it perfect. And never use the clutch. The only place I use the clutch is at a stop sign, and that's only if I can't do a calif stop. I don't know what grapevine you went up or down. But its 47 miles across. 5 miles on both ends, up and down in between but no hill longer than 5 miles at 6 percent grade. That means it rises 6 feet every 100 feet traveled. So first gear in highside of trans iswhere you will pull loaded. From 400 hp and up every 50 hp more you will pull another gear higher. So cat five fifty pull hill in 8 the gear with 10 speed. Detroit 450 pull in 7 the gear fully loaded. They need to bring back the split your sleeper times. The worse thing about that 54.6 truck is I knew exactley how much time I was losing. Because when the brand new peterbilt would break down I got the rental. Bam set the cruise on 62 mph and pull 32 minutes off a 225 mile run. One way. That's when getting unloaded within two hours you could just to the 550 mile round trip legal. But only in rental truck. All trucks were day cabs so paper logs had to be pretty thought out. I got to where I was lying so much I didn't know what day it was for real. I was running from San Bernardino to Fresno everyday in a truck governed at 54.6 mph yes 54.6. Now right out of the box if you waste anymore than 30 minutes you cannot do it leggally. Because of a traffic accident, cal trans painting new fog lines. Or shipper or reciever holding you up. If you had e logs there is no way you could run that load. Typical day get to yard, go to town 43 miles away drop trailer find loaded trailer. Is it loaded right if not slide trailer axles. Its a light load only 53,550 lbs child be no problem getting that across or around scales. Whatever it takes right. So we don't stop we leave their drive 54.6 mph all the way except bottom of grapevine that is slightly downhill so you can go 65 for 7 minutes. But when you get back your gonna get another warning for driving to fast. 4 hours and 15 minutes you get there. But wait it takes 4 hours to unload. How do I make it back. Free time ! I got paper logs. Jeremy you can always find the real good drivers, they will be driving with those real nice driving gloves. And easy to find the companies paying the best, well that's easy there the ones with there wallets chained down. I did six loads a day from riverside to fontana. That's one million and a half lbs a week. Always 80 k lbs. Five days a week, Saturday and Sunday were maintenance days. Local driving is a lot more turning and really takes a lot more effort than setting the cruise at 65 and holding on tight. Remember experiance is what you get when you didn't get what you wanted. 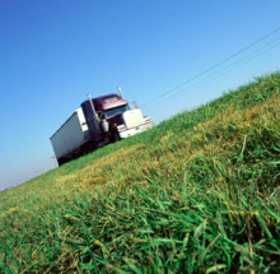 What to do while waiting until I'm 21 to become a truck driver? I was lucky I was able to get my cdl at 18. But that was 1980. New beggining, the day you stop learning something new is the day you can pretty much pack it up. You've won the game, nothing for you to learn here. Good day sir. I went from last day of high school to getting my class a license on my 18 bd. Went to work for my dad who had 3 trucks. Did that 4 years then bought my own. Did trucking for myself for 26 years. Watched the industry change damatically over those years. Good luck new drivers its the best job you will love to hate. Retired now at age 50.
Who has to pay for the damage? Lucky for you as a 1099 employee you get to match all your own social security taxes., but I'm sure you knew that. You get to make sure there all paid. It will go down as the other posters advice. If you don't wanna pay it his uninsured insurance will pay it., you will no longer have a job but hey you showed him. Then there's you pay it keep your job but remember you mess up a tire you will also pay for that. Morale of story trh as hard as you can to find non1099 workplace as that tax money will be spent like its yours and get you behind quickly. Sounds Like you need to stop and asess the situation and then do it right. First time. I ran 6 loads a day from riverside to fontana. Can you afford an APU its legal and your not running a 500hp. Engine To keep comfortable. Did you get a new truck, used one ready for rods and mains. Pull two one in the middle and one on either end. To rebuild an isx runs about. 15 k and c15 cat a little more. So I hope you got a low mileage truck. I had 4 trucks for a 27 year period so if you have questions I or some other owner operator will answer. I only had one cat a. 1982 k100 with a 3406 A model. It had nozzles instead of injectors. Plus the fuel pump was 4 K dollars. So I'm a cummins guy. Plus I had an 8. V 92T and an 8 v71t. Anyone remember those. Experience Owner Operators which used Tractor to consider? Kenworth. I've had 4 and they've all been great trucks with just regular maintenance. There called livelabs. And most drivers that drive those don't own a home. They are driving it. Poor *******, kicking his lunchpale home as he should be.